Waalkz is a company that I co-founded with my business partner. 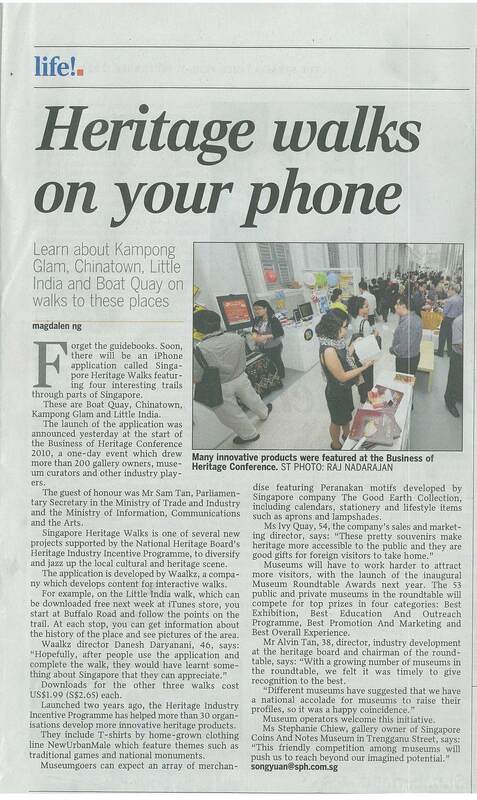 With the kind support of the National Heritage Board‘sHi2P grant, we developed our first 4 heritage walking tours in Singapore on Apple’s iPhone platform. These tours cover Little India, the Arab Quarters (Kampong Glam), Boat Quay and Chinatown (Telok Ayer side). The announcement was yesterday at the annual Business of Heritage Conference and the app will be available for download on the app store next week. Watch this space for the announcement on the day the app is ready for download. To encourage trial, the Little India walk will be available as a free download. The others will be priced at US$1.99. Do download and have a try. And please give us your feedback on Waalkz’s Facebook Page. You can see some screenshots there too. If any of you work in organisations who would like to develop walking tours, message us on our Facebook page. We’re currently working on our website and will let you know when it’s out.